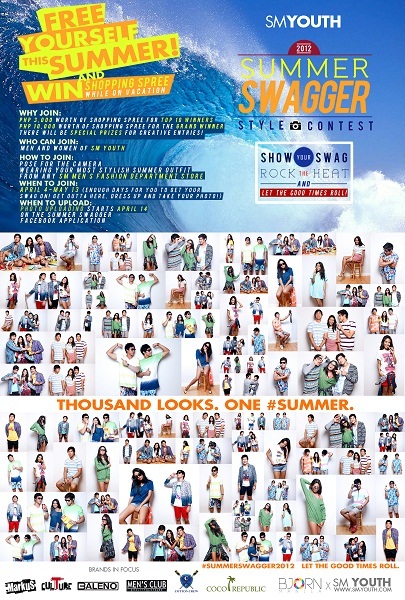 SM Youth’s Summer Swagger Style Photo Contest was launched last month and uploading of entries will be on May 13, 2012. An avenue where the youth of today are able to express their creativity through fashion. While you are already at enjoying the summer vacay, hitting the beach or simply getting tanned via airbrush tanning systems, getting your swags on, you might as well enter this contest and get a chance to win. Joining is as easy as posing for the camera wearing your most stylish outfit from SM Men’s Fashion Department Store and upload on the Facebook application. Ten young people will take home P3,000 worth of SM Gift Certificates and the grand winner, P10,000. Not bad for most young people who are loving what they are already doing anyway. Check out the SM Youth Lifestyle Fan Page on Facebook for more details.